USDA Certified Organic Tea Tree Essential Oil (Melaleuca alternifolia) is also commonly known as Melaleuca. 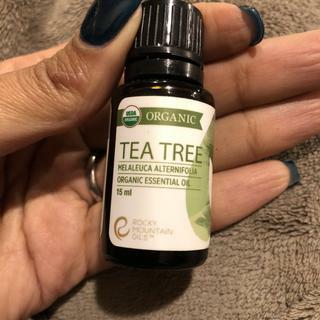 Organic Tea Tree Essential Oil has a medium-strength fresh and herbaceous aroma presenting a top-middle fragrance note. We included the versatile Organic Tea Tree Essential Oil as part of our Wellness and Skin Care collections. Tea tree is a strong yet gentle oil to use in skin and hair care routines. Use the oil in natural DIY cleaning products, including surface cleaners and soaps. Diffuse tea tree oil to help purify the air. Mix oils and water together in a large bowl. Add Sea Salts and soak your feet for a 20 minutes. Combine all ingredients in a 4oz glass spray bottle. Fill the bottle the rest of the way with water. Shake well before each use. Spray all around the top of bedding, pillows, and couches for super fresh linens and a super fresh home. Great product, great quality oils, I love the option of purchasing organic oils. We've been buying Rocky Mountain Oils for 4 yrs and they've always provided quality products at affordable prices! Doesn’t smell like other tea tree oil from RMO. are all your products 100% organic, non-refined, cold-pressed and pure? All of our essential oils are 100% pure, natural, therapeutic and organically grown. They are GMO-Free, GC/MS and Pesticide tested. To ensure that every bottle of oil that we sell is 100% pure, we work with quality farmers and distillery technicians who are experts in their craft. Every detail from growing, harvesting, distilling, shipping, storing, testing to bottling must operate under exceptionally high standards. Can you consume tea tree oil?